1. Heat large covered saucepot of salted water to boiling over high heat. Add sprouts; heat to boiling. Cook sprouts 5 to 6 minutes or until tender-crisp; drain. Meanwhile, in large skillet, cook almonds over medium heat 5 to 6 minutes or until golden brown, stirring frequently; transfer almonds to plate. 2. In same skillet, cook bacon over medium heat 5 minutes, stirring occasionally. Add onion and cook 4 to 5 minutes or until tender, stirring frequently. Stir in garlic and thyme, and cook 1 minute. Stir in vinegar, brown sugar, salt and pepper; heat until mixture simmers. Stir in sprouts; heat through. Transfer sprouts to serving bowl; sprinkle with almonds. 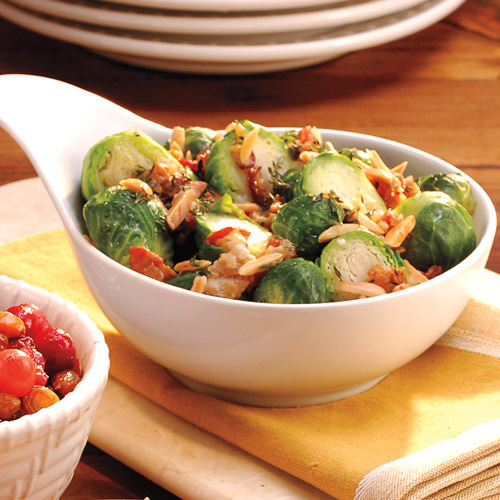 Brussels sprouts can be boiled 1 day ahead; drain in colander, then rinse with cold water to stop the cooking process. Drain well, then transfer to large zip-top plastic bag.